Indian League champions Minerva Punjabsigned 20-year-old striker from Nagaland Hitova Ayemi from Fateh Hyderabad FC for two years. A delighted Hitova said he was very happy to have signed with the champions coming from a place like Nagaland which according to him does not have as much exposure in football as other parts of the country. Hitova made his senior team debut from DSK Shivajians Football Academy in Durand Cup at the age of 19. “I am very lucky to have signed with the champions and I hope I do well here. I will have to because it is going to be very competitive. Even if there’s no prize at the end, no one wants to end up on the losing side,” he said. “Yes, I am more than motivated. I’m just like, straight up, I came here to play football, to perform, do well for the club and I hope it goes well,” Hitova who is confident about this move and his teammates said. The young winger comes with a clear target. “I’m confident about this season. I’ll work hard, give my 100% and take one step at a time. Would like to thank the club for giving me this opportunity and platform to showcase my talent and I hope I do justice to the same,” he said. On his dreams, Hitova said he wants to make it to the national team soon. “Obviously, I would like to make it big here. I hope I will improve here. There have been many young players in the past who were playing in the top division at a very young age and have made it to the national team. I’m very sure that I have come to the right place. If I do well, this will be the best spotlight on me. Minerva has been the right kind of platform for the youth,” Hitova stated. He said Minerva Punjab is going to play in every competition possible this season. Hitova was full of praise for Minerva Punjab executive director Ranjit Bajaj.“I have heard a lot about him: how determined, dedicated, passionate he is and how big a fan he is of football. I look up to the people who are so enthusiastic and involved in the game,” he said. “I play as a winger or as an attacking midfielder. There will be players who are more experienced than me, so obviously there is some competition there but also I can learn a lot from them,” he said. The promising footballer got a break when Shillong Lajong Football Club invited him after his 10th standard. After a short stint in Shillong Lajong, he went to South Korea to train for two months. 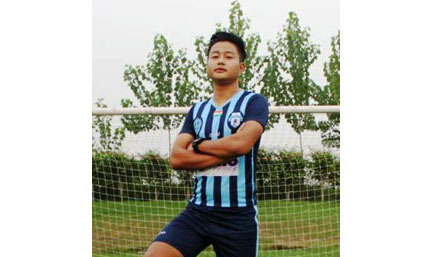 After his return from South Korea, Hitova was selected by DSK Shivajians Football Academy when the latter came to Shillong for scouting young players. The former Fateh Hyderabad FC player was grateful to his former club. He said: “I am also very grateful to Fateh Hyderabad as I was on the receiving end of a lot of guidance and on-field experience.